photo gallery from La Prensa with pictures of Holy Thursday activities from the beach to religious observances. 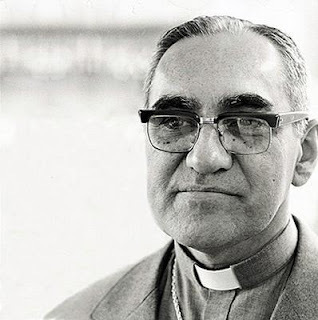 To commemorate the 33rd anniversary of the martyrdom of Oscar Romero, here is an excerpt from his sermon preached on Palm Sunday in 1978. How much does your cup of coffee cost?. The photo essay shows images of some of the hundreds of thousands of Salvadoran who work in the coffee industry during the four or five months of the harvest. For those who actually pick the coffee, the going rate is $1.25 for each bag of coffee cherries, and a picker can pick about 4 bags per day. For workers involved in carrying, hauling, drying, sorting the coffee, average wages are $70-75 every two weeks. How will the diaspora vote? In the 2014 presidential elections, Salvadorans living outside of the country will have the chance to vote from abroad for the first time. Given the size of the Salvadoran community living in the US, Canada and elsewhere, there could be a noticeable impact on next February's elections. Already, Salvadoran politicians are campaigning among Salvadoran communities in the US. The most recent monthly El Salvador Update from the Center for Democracy in the Americas has a description of where the US has stood with respect to the gang truce in El Salvador: The U.S. Embassy has remained aloof from any endorsement of the truce. But, according to one government official, it has not been an obstacle, despite the recent State Department-issued warning about the dangers of travel to El Salvador. Ambassador Mari Carmen Aponte reiterated on February 7th that the United States “is not collaborating in economic terms with the so-called security zones.” She added that the State Department Travel Warning issued in January does not affect the strong bilateral relationship between the United States and El Salvador. It is one thing to talk about El Salvador's gang truce in blog posts and newspaper articles. It is another thing to live in communities where crime is prevalent. How do the bulk of Salvadorans view the truce? In polling by the University of Central America during mid-November of 2012, there were high levels of skepticism about the truce. 66.4% of those polled believed that the truce had reduced the level of crime little or not at all. 89.4% of the respondents had little or no trust in the truce. La Prensa Grafica polling in February 2013 showed that 55.2% of Salvadorans had a negative opinion of the truce while only 29.7% had a positive view. The respondents were about evenly split over whether or not there should be negotiations with the gangs. And 70% said that one could not trust the gangs to fulfill their promises. The International Assessment and Strategy Center (IASC) recently published a report on gang activity in Central America which has received wide discussion in Salvadoran media and elsewhere. IASC is a think tank which does research and policy analyses on global security issues. The report is titled Central American Gangs and Transnational Criminal Organizations: The Changing Relationships in a Time of Turmoil. The lead author is Douglas Farrah, a senior fellow at IASC. Today is the one year anniversary of the gang truce in El Salvador. In El Salvador it was marked with a ceremony declaring the city of Apopa to be the 5th "city fee of violence." At the event, gang members turned in over 267 weapons. In these cities, the gangs agree to cease criminal activities, and the local governments make commitments to projects where gang members can find training and employment. The gang truce in El Salvador is a year old. But a murder this week highlights how much we do not know about the motivation of the gang bosses and highlights that violence is still taking too many lives. An ex-gang member, who worked on programs to re-insert former gang members into their communities has been killed. According to news reports, Edgar Giovanni Morales was murdered by two assailants outside the church of San Francisco in the municipality of Mejicanos, a suburb of San Salvador. El Salvador's presidential campaign season for elections next year has begun in earnest, and La Prensa Grafica has some early polling data about voters' preferences. 8.1% -- GANA, PCN or PDC (Tony Saca) As in elections over the past 20 years since the peace accords, the two major parties still dominate the loyalties of the voters in largely equal measures. In a poll result which might not bode well for the country's current vice president, Salvador Sanchez Ceren, 49.3% of Salvadorans said they want a change of party in power in the government, and only 37.3% want a continuation.